After trying out the Pacca Alpaca Basic Learning app, we knew we had to try Travel Playtime, another one of their apps. We noticed the children enjoyed playing this one as much as the former as there were a variety of games to be played, from dot-to-dots to spot the differences. There were so many tasks to choose from, ranging from I Spy to drawing their own scenes. 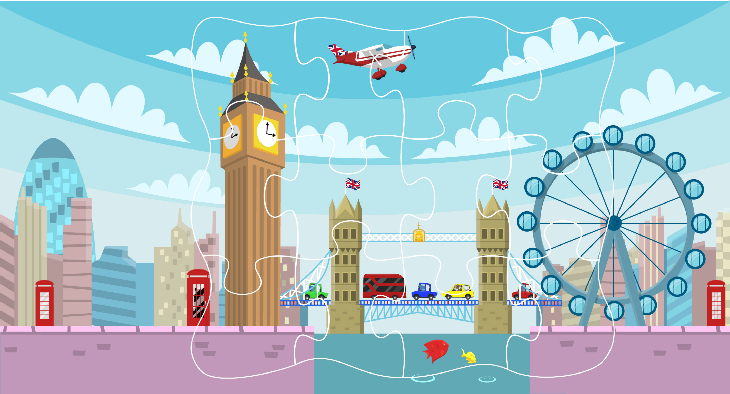 They were able to complete puzzles to construct gondolas, use building blocks to recreate Buckingham Palace and attempt to find missing Otter in busy New York. It provided them a chance to absorb information without the realisation that they were learning, simply because they were having such a good time. Other tasks include spot the difference, dot-to-dots and adding stickers to the scenes. It certainly kept their interest for a long time and all of the kids who fit into the 2-6 age bracket found it incredible. They loved dancing to the music, trying to remember which flags belonged to which country and they were excited at the possibility of creating images of these landmarks on the screen. There is nothing complicated about the app which makes it ideal for young children. As adults we also enjoyed the app immensely and thought that it was great for showing the children famous places throughout the world. When the children have completed each task, a full drawing of the landmark pops up as well as an image of the flag of the country it was in. The one thing we wished the app would do would be to actually state the name of the landmark as well as the country – that way the children could then do further research or ask questions about it, teaching them even more. The graphics are brilliant and it’s simple enough for a child as young as 2 to understand which is something that many apps state but is not always true. It’s not going to break the bank when you purchase it but for the small price you do pay it will undeniably keep the children both entertained while learning for an extended period of time. We would highly recommend it to anyone who has a young child interested in travelling. Pacca Alpaca Travel Playtime is available from Google Play, the App Store and Amazon. Click through to your chosen app store from their website to view the app at its current discounted price, running until the 30th December!